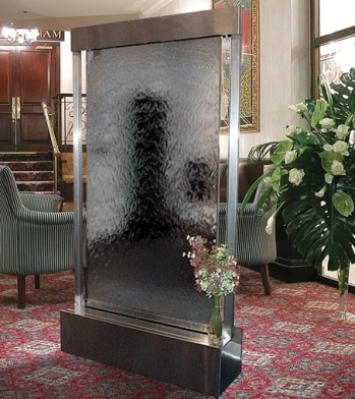 New design - hanging water panel feel, features stunningly beautiful stainless steel floor fountain with a center mounted mirrored glass water panel. Water cascading evenly over the smooth mirror surface creates an exciting shimmering visual effect. A custom logo etched on these fountains makes a memorable statement in any lobby or entryway, contact one of our custom sales representatives for artwork requirements and pricing.